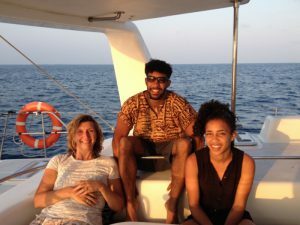 Zanzibar Day Charters by Zanzibar Yacht Charter | Join us onboard today! 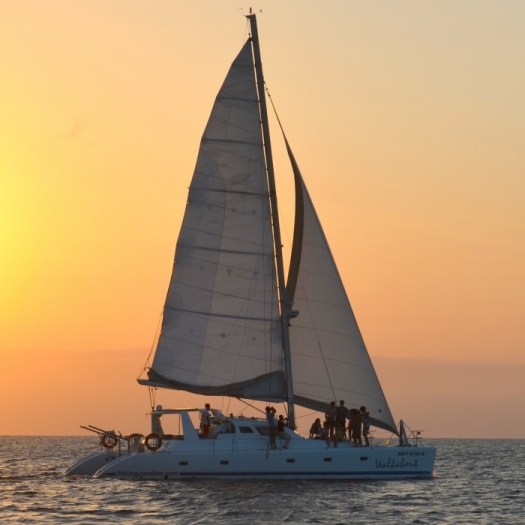 Escape your hotel and join us onboard a yacht for one of our fun filled Zanzibar Day Charters! Experience stunning Tropical Island scenery, crystal clear warm Indian Ocean waters and amazing sea life! Swim Time at Mnemba Island! Cruise onboard with us out to the Mnemba Island Atoll! The stunning beauty of this tropical island atoll will blow you away! 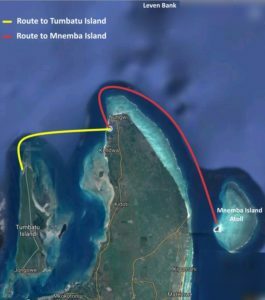 After slipping our mooring lines in Nungwi, it is about a 2 hours sail to get to the Mnemba Island Atoll. If there is wind we will put up the sails! 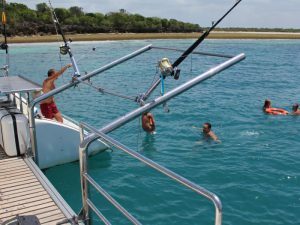 Alternatively if there is no wind, we will start up the motors so feel free to make use our onboard Fishing gear and get some lines wet. Freshly caught fish is always very welcome onboard! Enjoy some tasty snacks with a freshly prepared tropical fruit platter along with a selection of ice cold drinks. Oh, and along the way there is a good chance that we will see dolphins! Lie down on our trampolines up on the front and enjoy watching these beautiful creatures swimming along with us and surfing our bow wave. Bring along the kids for Blue Water Fun! Sunset Cruising back to Nungwi! 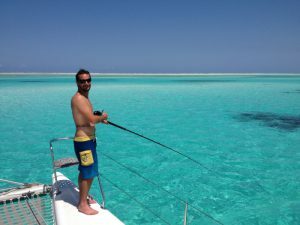 Upon arrival at the Mnemba Atoll we will drop the anchor in a stunning, crystal clear lagoon. Here in the turquoise waters of the lagoon you will enjoy some of the best Snorkeling that Zanzibar has to offer on the reefs close by. Not to mention the fantastic SCUBA Diving! Jump in and enjoy the shallow reefs and drop-offs, swim, or just take it easy and soak up the sun. Here in this stunningly beautiful setting, you will be served a freshly prepared seafood lunch. Enjoy with a cold glass of wine or a beer, along with a selection of ice cold non-alcoholic drinks. PLEASE NOTE: GUEST ARE NOT ALLOWED ON TO MNEMBA ISLAND ITSELF AS THIS IS A PRIVATE LODGE. This is the way to cool off! Our Half Day Charters depart from the beach here in Nungwi. 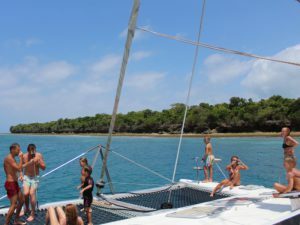 As soon as our crew have slipped our mooring lines we will head out to Tumbatu Island. To begin with, you will enjoy freshly made fruit smoothies served onboard, along with a fruit platter, breakfast cereals and tea and coffee. Now that is the way to start the day! Along the way we can be trolling for Big Game Fish or Sailing should the wind be good! Upon arrival, we will then anchor off Tumbatu Island. Here you can Snorkel the beautiful Coral Gardens in the clear warm shallow water or go for a SCUBA Dive and enjoy the beautiful abundant reefs that surround the island. Take a swim, or relax and enjoy, followed by some refreshing drinks and snacks en route back to Nungwi. 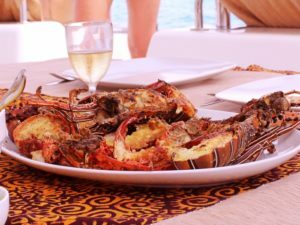 Both our Day Charter Options depart from the beach here in Nungwi on the northern tip of Zanzibar Island. Morning Half Day Charters depart at 7 am and return to the beach at 12 pm. Afternoon Half Day Charters depart at 1 pm and return to the beach at 6 pm. 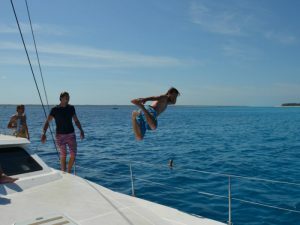 Full Day Charters depart at 9 am and return to the beach at 5 pm. Contact us and we will book your Hotel Transfer to Nungwi for you. Furthermore, our transfer service will pick you up at your hotel reception and return you to your hotel after your cruise. Call, email or WhatsApp us now and we will get back to you with pricing and pick up times from your hotel reception.